The NGC001 Natural Gas Conversion kit is suitable for all BlueTongue BT8SS BBQ combos. 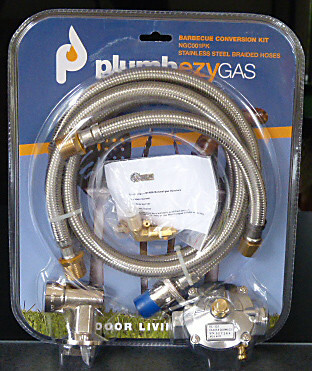 This kit can be used for conversion of your BBQ from bottled (Propane) gas to Natural (town) gas. 1 x Back burner brass gas injector with elbow. PLEASE NOTE: This conversion kit is approved for, and must only be used with the BlueTongue BT8SS series BBQ and BBQ Combos. It is not suited to other brands of barbecues. We will not supply this kit if proof of purchase of the BlueTongue product cannot be provided so please DO NOT order if this is the case.